Alienware said its Steam Machine would arrive in the second half of 2014, and it wasn't lying. The hardware maker revealed during the Steam Dev Days developer conference that it plans to have the Alienware Steam Machine ready for a September launch. Though media weren't allowed at the event, several attendees have trumpeted the release month on Twitter, including Dave Oshry, director of marketing at Gunnar Optiks and CFO at Hot Blooded Games. He wrote: "Alienware on stage now with their Steam Machine. Launching in September." Bryan de Zayas, global marketing director at Dell's Alienware, gave TechRadar a more nuanced answer when we asked for confirmation about the box's release. "We are planning to be ready for the holiday season," de Zayas wrote in an email. "September is our goal but that is still a long time away and things can change." 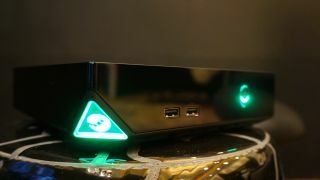 We checked out the Alienware Steam Machine mockup at CES 2014, and while spec details are still sparse, it will house Intel silicon and GPUs by Nvidia. It's designed to stack up nicely against the Xbox One and PS4, including in price. Release dates and specs weren't all Alienware had to talk about at Dev Days, however. "Alienware - we are not Microsoft, if you think things can be done different, let us know and we will respond. #SteamDevDays." de Zayas told us that "Alienware has been gathering feedback from game partners and gamers for well over a year as we've been defining the Alienware Steam Machine. We welcome any and all feedback so that we can continue to improve what is the most important thing to gamers, the gaming experience." We'll continue updating this story as more details become available, but until then check out what other properties Valve wants to add to Steam Machines and swallow your envy over news all Dev Day attendees were handed a free Steam Controller and a Gigabyte Steam Machine. Another outlier should see major manufacturer support next year.